Anchor (population 175) is located in eastern McLean County on Illinois Route 165. The town began to form in 1879 when local farmer Daniel Stewart platted the town on his land to entice the railroad to build tracks through it. The town was dubbed "Anchor" by George Buck, an ordained minister of the day. The Illinois Central Gulf Railroad owns tracks which take a curve through the center of town. A branch of the Mackinaw River also flows through town. 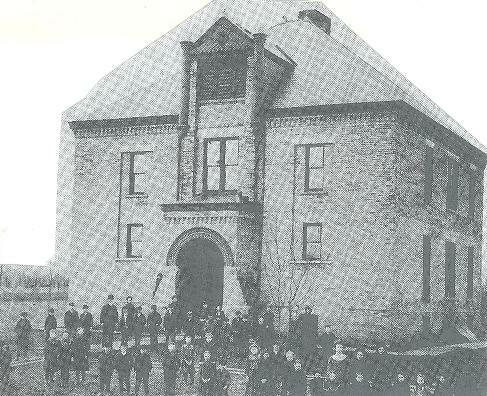 Anchor Township began an educational system for its children in 1858. Following construction of a new school in 1895, a first year of high school studies were added to the grade school program in 1896, followed by a second year in 1907. In 1916 the school gained state recognition as a high school when it added a third year to the curriculum. The fourth year was set in place in 1922, which required a gymnasium. classrooms, and an assembly hall to be added on in 1923-24. 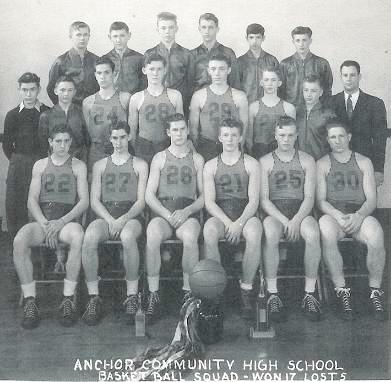 It is known that Anchor High School existed through the late 1940's when a consolidation effort between the neighboring high schools of Anchor, Cooksville, and Colfax took place. It became a reality in 1949 when Octavia High School was formed and all students were brought to Colfax. The Anchor school building was used as a grade school for the Octavia school system for a while before eventually being phased out. The fate of the original Anchor High School building is, like all to many other small communites, a sad one. The Anchor School building was torn down in 1975. A second consolidation effort took place between Octavia High School and Saybrook-Arrowsmith High School in 1989. 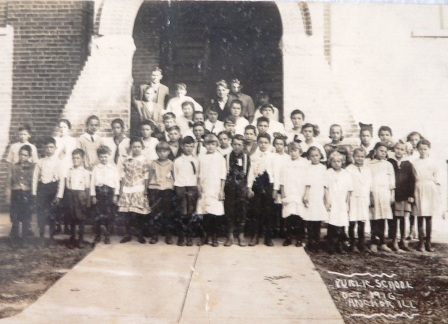 The children of Anchor still attend school in Colfax but now as part of the Ridgeview School System. A good account of the history of Colfax Ridgeview High School and Anchor's role in its development can be found at: http://www.ridgeviewfootball.us/story.htm. School Fight Song: "Anchor High Loyalty"
Sung to the Illinois University Fight Song tune - click below left to listen. For we know you have sand, Anchor High! Victory from you Anchor High! Dear Alma Mater, ANCHOR HIGH! 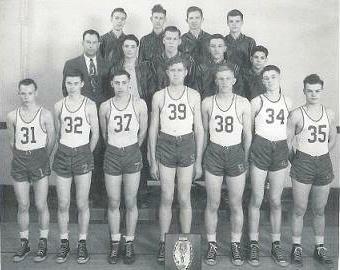 It is a fact the Anchor High School Aces competed in boys' basketball. 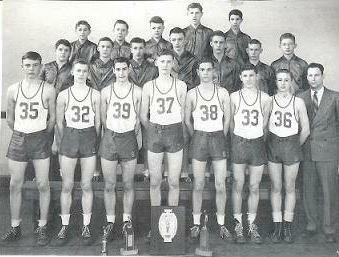 The Aces also competed in baseball, cross country, and track. We are hopeful for some assistance from an area fan or resident to help us in researching this information. If you have any photos or information on the athletic program at Anchor High School please send them to us at dr.veeman@gmail.com. The Anchor High School "Aces" had a great run to close out their school. Did they sense their impending school closure and want to show some final pride for their town? Did they have a great coach move in and strike up this one last measure of glory? Perhaps a great athlete or group of athletes led them to this final last hurrah? **Final boys basketball game for Anchor High School. 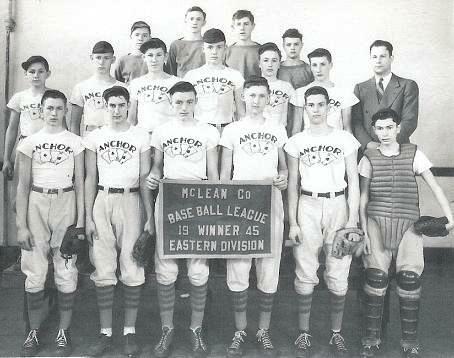 The Anchor HS Aces also faired well in baseball, a fall sport of the day. The records and accomplishments that could be researched are listed below. No state hardware, but a very competitive group nonetheless. The Anchor kids proved they were loyal to Anchor High, sending the school out on a good note. The pride of the Anchor High School Aces still lives strong in town today. Some of the Anchor High School athletes have stayed in Anchor their entire lives. Chet Eyer, member of the '45 baseball champs as well as a member of the '46, '47, and '48 basketball champs, still resides in Anchor. 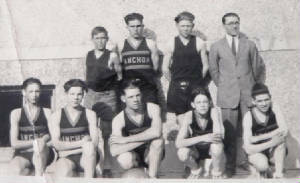 Two of Chet's starting teammates of the '47 and '48 basketball champs, Donald "Diz" Bielfeldt and Eugene Reicks, are also life-long residents of Anchor. A fourth starter, Erwin Epperson, resides in nearby Leroy while the fifth starter, Donald Simpson, lives in Wisconsin. "What a great website!! Brought back many memories of Anchor HS (and grade school) Many excellent teachers (remembering Paul Orr-coach, science, biology, ag, and about all others). Keep up the good work. Thanks!" Special thanks go out to Chet and Gladys Eyer, who opened their doors, personal scrapbooks, and hearts regarding their beloved Anchor High School to our own Kev Varney. Check out Chet in the photos above. 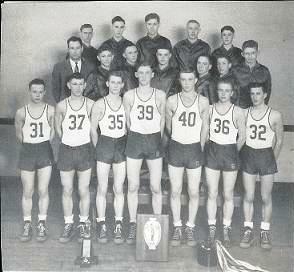 Chet Eyer is #33 in the 1945-46 team photo and #37 in the 1946-47 and 1947-48 team photos! 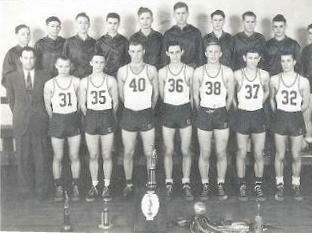 Chet is also in the photos of the baseball team below (middle row, 3rd from the left) and 1944-45 basketball team shown below (back row, 2nd from the left).